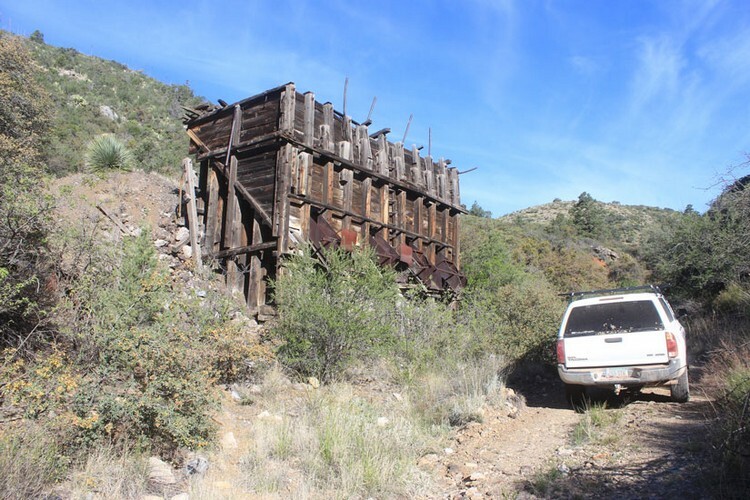 The Princess Pat Mine was a copper producer in the Stanley Mining District of western Graham County. 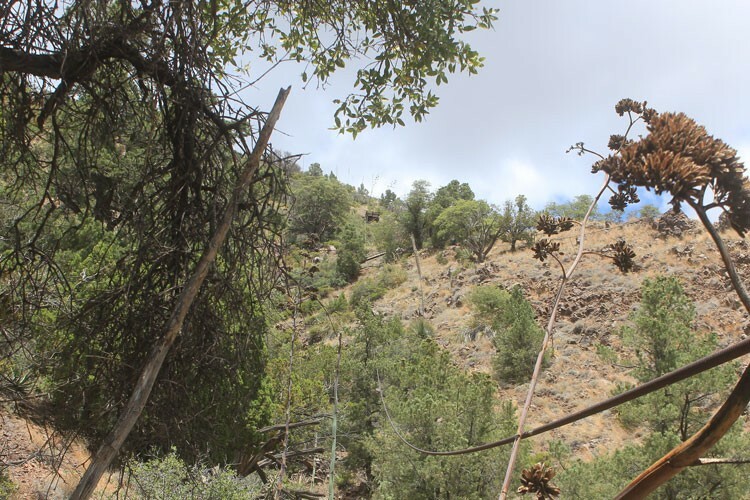 It was located in the upper reaches of Deer Creek Canyon, on the west side of the Santa Teresa Mountains, approximately 12 miles northwest of Klondyke. After a trip to the Iron Cap Mine, near Landsman Camp, I was curious about the road that continued on past the old mine. 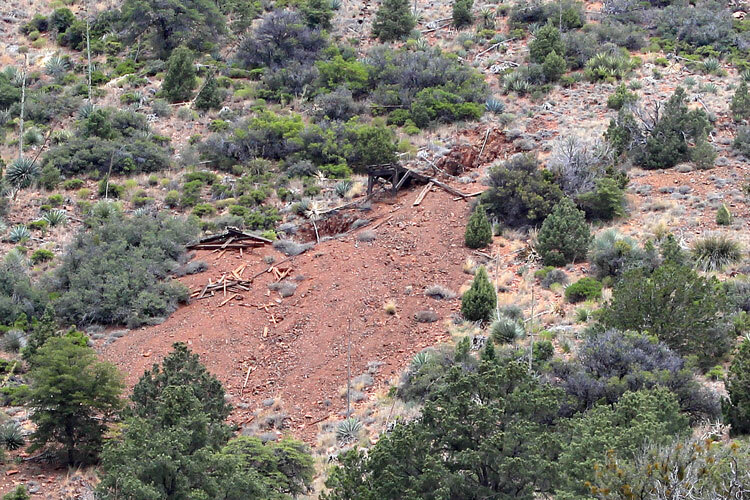 A "fly over" of that area using Google Earth showed that the road ran for a few miles to the north and then dropped down into the Deer Creek drainage. 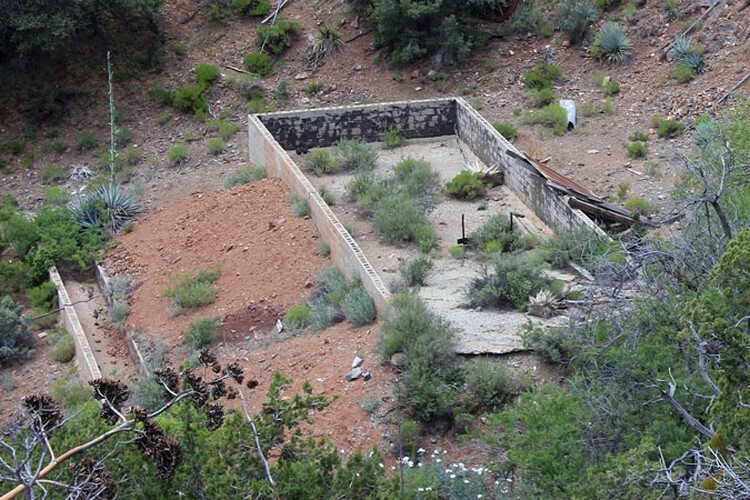 Several manmade structures, and a mine site could be seen in the canyon not too far downstream. I had to go check those places out. A bit of research identified the mine as the Princess Pat. 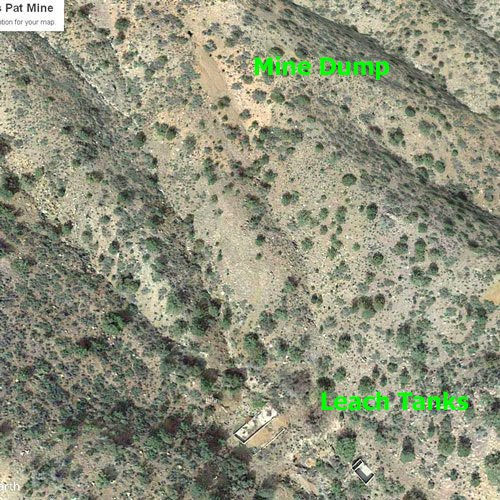 This map shows the relationship between the various points of interest in the area of Aravaipa Canyon. 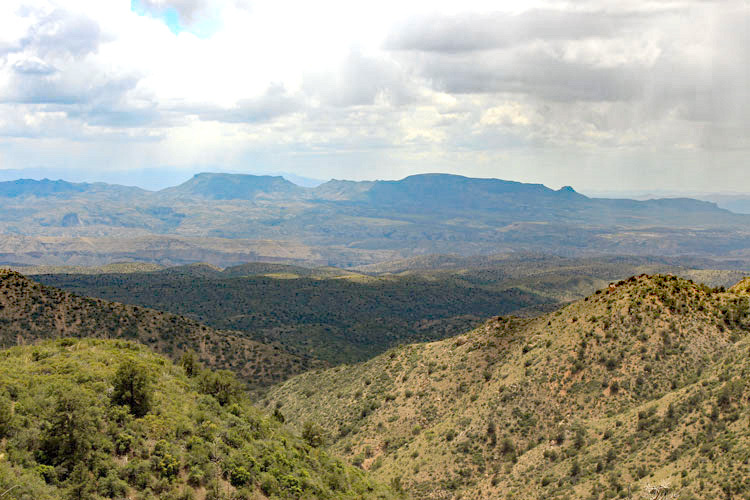 It is from a BLM publication "Environmental Changes in Aravaipa 1870-1970". The Princess Pat Mine was the southernmost mine in the Stanley District. The district took its name from Stanley Butte, a prominent landmark in the area. The butte, in turn, was named for a Lieutenant Stanley who was in the area in the 1860s. Lt. Stanley was in charge of a military guard unit that was standing watch over a survey party as they made their way down the Aravaipa. 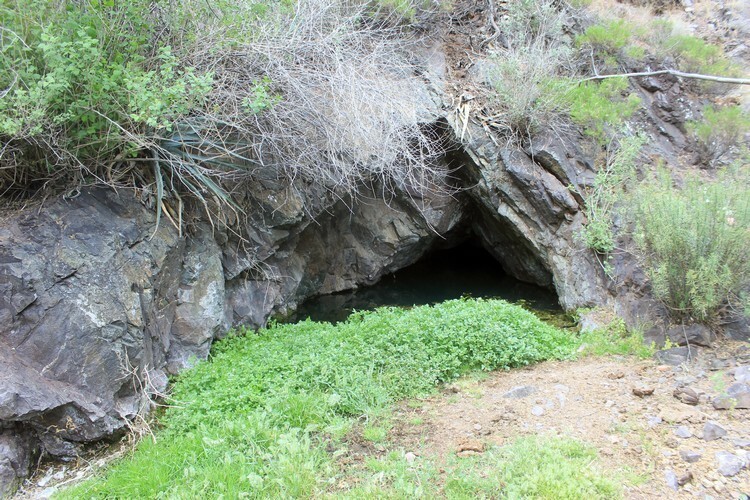 Mineral deposits were discovered near Stanley Butte by the 1880s, Although the area was inside the San Carlos Indian Reservation, prospectors wandered the area. When the southern boundary of the reservation was re-drawn several miles to the north in 1896, mining activity increased and the town of Stanley was established. The Princess Pat Mine is located on the south side of Stanley Butte. Its history dates back to 1900. The mine, composed of 44 claims, was one of the larger properties in the district. 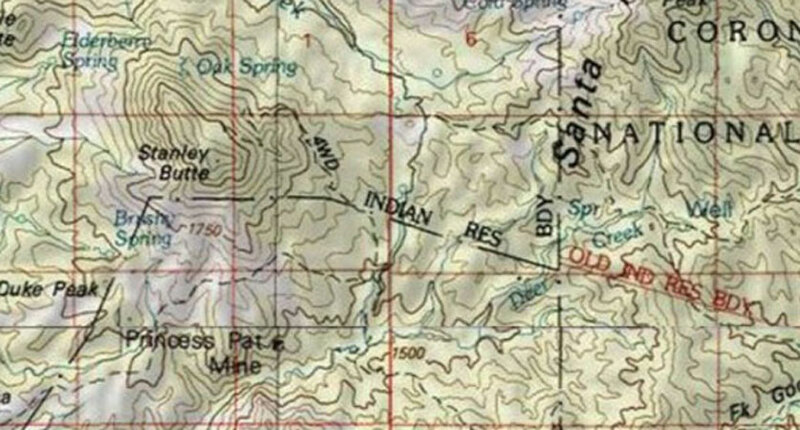 The map below shows a section of the original access road, which came down from the north off a road that connected Globe to Safford. It crossed the San Carlos Reservation, passed by the post office in Stanley, and then continued 4 miles on to the mine site. 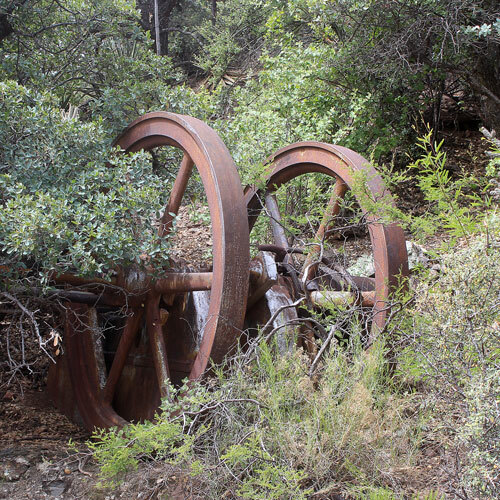 Ore was transported out to railroad stations near San Carlos. My understanding is that it is no longer possible to travel that old road. 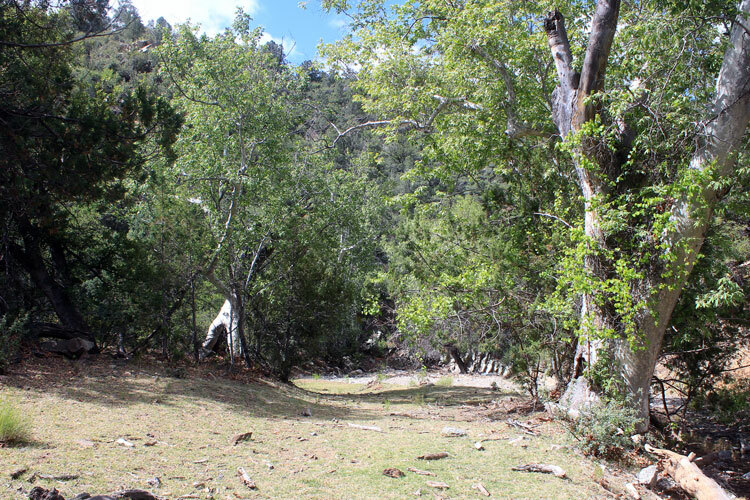 In the early 1900s, Deer Creek was identified as "Old" Deer Creek. At 7000' in elevation, Stanley Butte dominates the landscape. The road, in the foreground, is a part of the route to Deer Creek from Landsman Camp. The Princess Pat Mine, not visible in this photo, is located inside the left margin about 2/3 of the way up the mountain slope. In the 1960s, the southern boundary of the San Carlos Reservation was restored back to its original location. Today, the summit of Stanley Butte, the Stanley town site, and the old mines north of the butte are once again a part of the reservation. 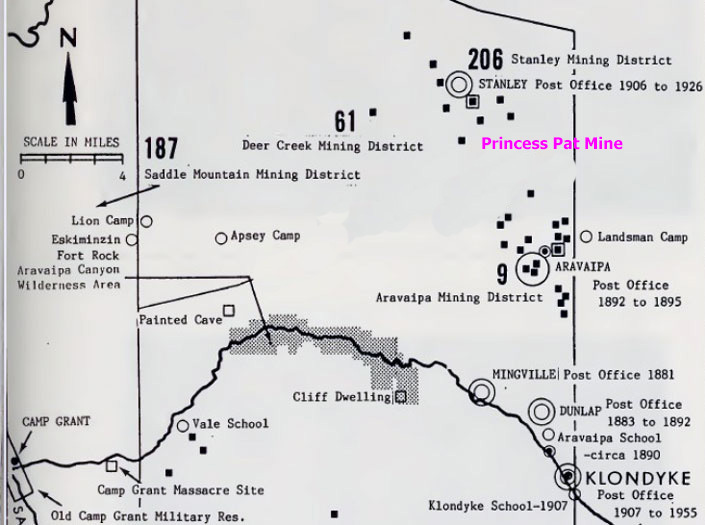 The Princess Pat Mine may be the only one of the Stanley District mines that is not on land controlled by the San Carlos Apaches. Permits are required for non-tribal persons to go onto the resrvation. The road that connects to Deer Creek through Landsman Camp does not appear on any of the topographic maps that I have seen. The maps do show several pack trails. 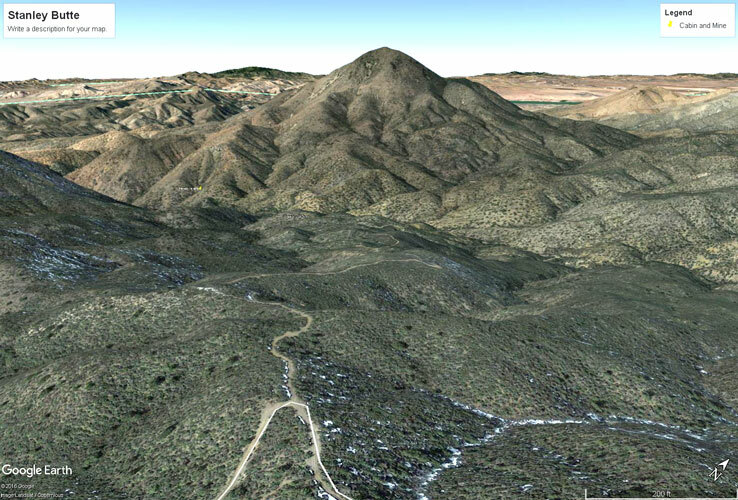 This Google Earth view, in the direction of Stanley Butte, includes the "pack" trail that I drove to Deer Creek. I do not know when the trail was upgraded to a road. Until the pack trails were upgraded, there was never a path for vehicles to travel between the Stanley District and Aravaipa. If the road from Landsman Camp did not exist, or was not open, there would be very little, if any, vehicle access possible into this area. The road north from Landsman Camp is narrow and does not seem to be well traveled. Beyond the Iron Cap Mine, it climbs steeply to a high ridge east of Horse Mountain. From that ridge, at an elevation of 6000', there are great views in all directions. To the southwest are Little Table Mountain, Table Mountain, and Holy Joe Peak in the Galiuro Mountains. On the day that I was in the area, smoke from a fire that was burning in the Pinal Mountains near Globe could be seen to the northwest. 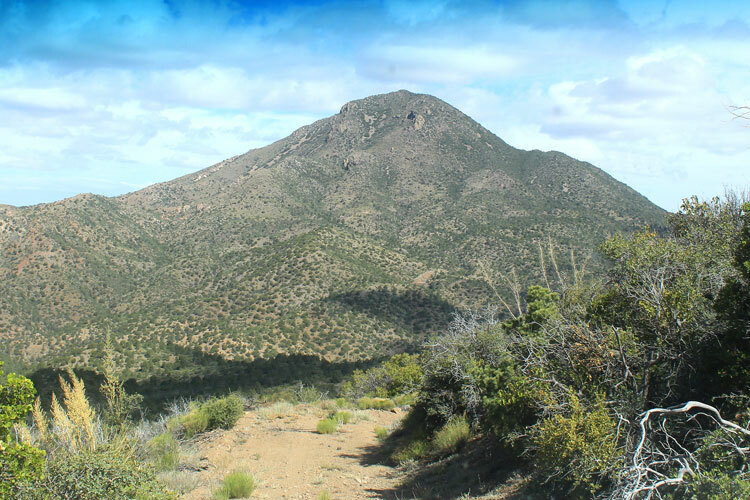 It is approximately 40 miles straight line from this location across to the Pinal Mountains. 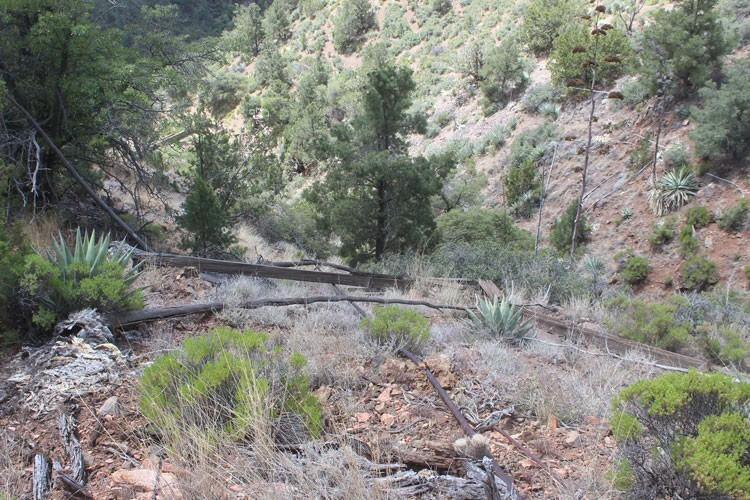 The road from the ridge line down into Deer Creek Canyon is narrow and steep. Once at the creek, I parked at the first crossing and continued the trek on foot. This spot would have been a quality camping place. Along the creek, short stretches of the old road were occasionally visible. In between, it would have been a challenge to proceed in a vehicle. Approximately 1/2 mile downstream, I came across an old shed and this loading chute. The chute was here to load livestock into a truck. Trucks need a road. Was it the local rancher who had upgraded the pack trails? The chute and its pen have not been used for quite a while. 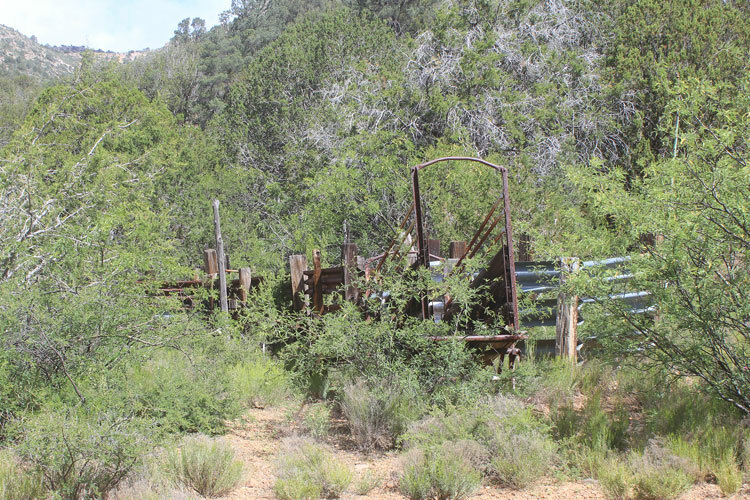 This clearing and old cabin were along the creek not far below the loading chute. 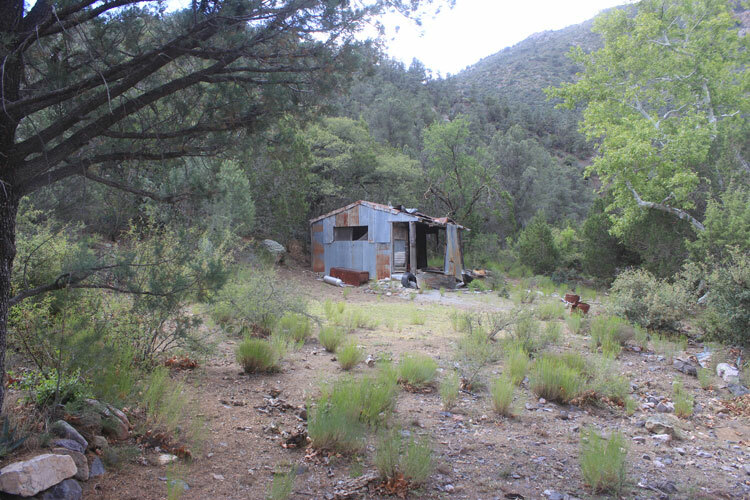 In a 1925 report for the USGS on the "Geology and Ore Deposits of the Aravaipa and Stanley Mining Districts", Clyde P. Ross wrote: "The company built a number of tent houses and shacks on a patch of level ground on Old Deer Creek". I think that this clearing may have been that location. Across from the clearing, the old road began its climb up to the Princess Pat Mine site. This was the view on down Deer Creek Canyon. I could see water flowing in the open spaces between the trees. 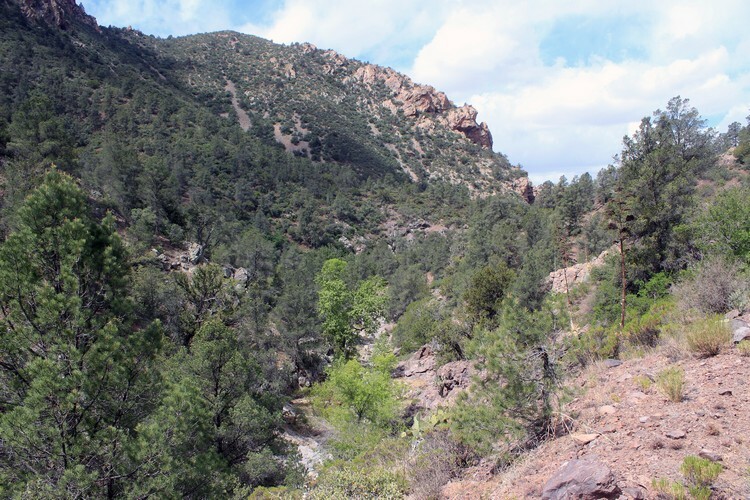 Several miles on downstream, the canyon's scenery and geology are very different. 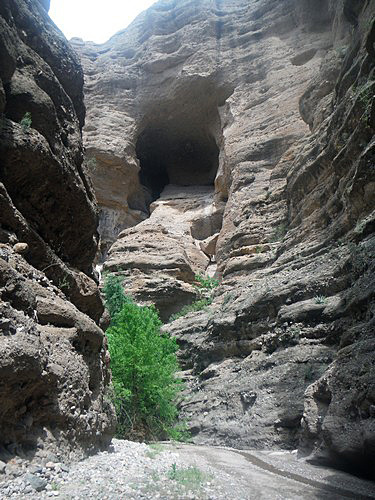 There, Deer Creek Canyon becomes the "Hell Hole", a narrow, and deep, slot-like feature that runs for nearly 5 miles before emptying into Aravaipa Creek. By 1925, or so, mining activity across the Stanley district had essentially ended. With no other work available, the miners left and the town of Stanley was abandoned. The Princess Pat claims were not patented and were returned to the public domain. In 1957, another attempt was made to bring the Princess Pat Mine back into production. 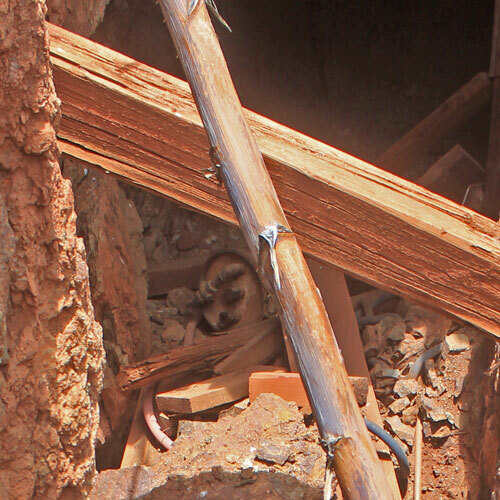 A vat leaching program for the recovery of copper was implemented. The three large concrete block structures that are at the mine site today are from that project. A field engineer's report written in 1957 indicated that 9 persons were employed at the time. This 55' long tank was used to store the water needed in the leaching process. There was no information provided as to where the water came from. The owner of the claims in the 1940s declared that there was "plenty" of water. He did not provide specific information on how much was "plenty" or where that "plenty" would come from. The water tank is located next to this flooded adit. In the 1925 Ross report, it was noted that the tunnel had been dug in 1916 by the New York based Princess Pat Mining Company. For all of the effort that was expended to create the nearly 900' tunnel and its three cross-cuts, there was no ore shipped. In 1918, the mining company suspended operations. At the time of the Ross report in 1925, the tunnel was beginning to flood and cave . Could this tunnel have been considered as a water source for the leaching operation? There are several lengths of large diameter pipe lying loose near the tank. Perhaps water was going to be brought up from the creek. The leaching vats are located on two benches that were created above the water tank. 1. The copper oxide ore (cuprite, malachite, azurite) was loaded into the large vat. 2. Water, or a water/acid solution was flooded over the ore to dissolve, or leach out, the copper minerals. 3. When the solution was saturated with the dissolved copper, it was transferred to the smaller tank that had been filled with shredded "tin" cans. 4. The solution would have reacted with the iron in the cans and any dissolved copper would have precipitated out of the solution. 5. When the precipitation was complete, the materials would have been dried, and then shipped as "precip" or "cement" copper. The dark area between the tanks is from a pile of old cans. At other leaching operations, like the one at Courtland, the soil and concrete foundations are really discolored from the effects of the chemicals used and the iron from the cans. Those discolorations are not as evident here at Princess Pat. The "Geology of the Klondyke Quadrangle" was published in the 1960s. In that report, the author wondered whether any leaching actually ever occurred here. Where was the source of the ore? Old mining reports mention that in the early 1900s a ton of copper oxide ore was shipped. At the time of the construction of the leach tanks, there was supposed to have been enough ore stockpiled to "feed the mill". None of the reports that I have seen identify the places where the ore was dug. I did not notice any stockpiles on my walk around the area. There is an ore chute on the hillside above the leach tanks. 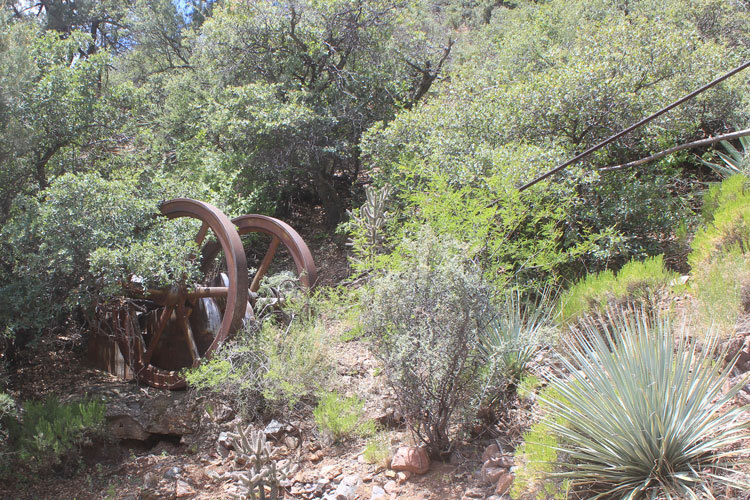 A suspended steel cable near the chute suggests that an aerial tramway may have been in use at some point in time. There are no reports of any tramway in the mine's history. The upper end of the cable ran to the structure seen near the top of the ridge in the center of the photo. Google Earth measured its location to be 650' above the ore chute. At its lower end, the 1 1/4" cable is attached to a large, old time, single cylinder engine. The flywheels of this machine are 5' in diameter. The tram cable was wound onto the engine's spool. I am not sure how that was done. I do not think that if the engine had been complete and operational, it could have been started and run with the cable attached. Had the flywheels been turned independently from the rest of the engine to accomplish the winding? Was that the reason that the piston rod had been disconnected from the crankshaft? To keep the cable from unwinding, short pieces of pipe were inserted between the spokes of the flywheels and the engine mount. I do not think that I would have trusted the survival of my tram system to the placement of a couple of pieces of pipe! Was the tram really used with this setup as the anchor? The old horizontal engine is missing a lot of its parts, including its head. The early reports noted that there was an engine and a compressor here at the mine. This engine was set-up to drive a flat belt. Perhaps its original purpose was to power the compressor. I could not find a manufacturer for the engine. At the ore chute, there is a proper cable winding machine. 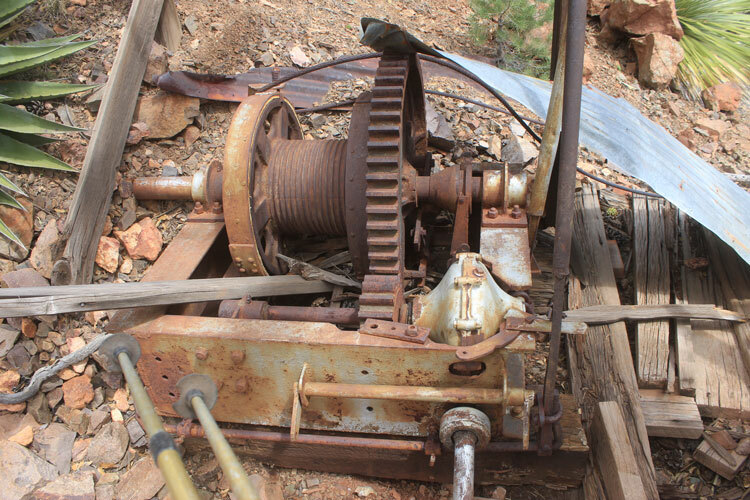 With its alignment parallel to the aerial cable, had this machine been used to control the movement of an ore bucket along the line? The drum does not seem that it would have had enough capacity for the length of cable necessary to raise and lower a bucket along the 600' or so of the tram line. The power source for the machine has been appropriated for use elsewhere. With the ore chute positioned under the cable, was a bucket simply lowered down the cable, parked over the chute, and then emptied? Part way up the hillside, the cable is on the ground. My guess is that it once was suspended from a support made with the beams that are now resting on the cable.. The cable continued on to this dump. There were two openings into the hillside. One was above the wooden platform and the other was below. The miners used the two openings to anchor the upper end of the tram cable. It was threaded through the upper opening and then back onto itself through the lower portal. Tension on the cable would have then tightened the "noose". Had this opening been constructed for a haulage tunnel that allowed access to the tram system? Was the lumber pile near the mouth a part of that system? 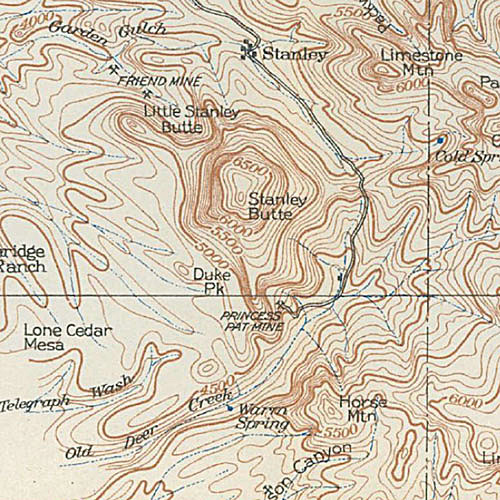 The rugged ridge across the canyon is identified on the topo maps as "Horse Ridge". This is the upper opening. It appears to me to be on a shear, or fault line. It is not a tunnel, but more an opening into a stope. The rock does not appear to have been very stable. A metal tank and hoses could be seen in the shadows. The "floor" was too dicey for me to get too close. It had been quite a strenuous hike up to the old mine dump. I did not come across any road or trail to use. Back at home, I looked over the hillside with Google Earth to see if I had missed a path. I did not see one. If there had been material brought down to be processed, it more than likely would have come down the cable. 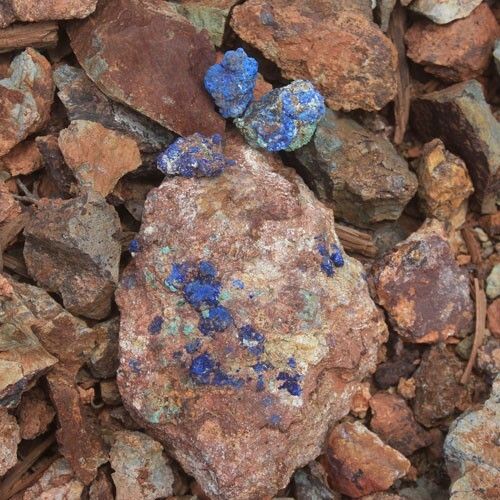 On the dump, these pieces of azurite and malachite caught my eye. I wish that I would have had time to look around some more. The mine's written history seems to end in 1957 with the construction of the leaching plant. I have not been able to locate any information after that part of the process, or for any time afterward. There are no records that describe whether the leaching operation was successful or not. If it was, where did the precip copper go? How much was produced? If the project did not work out, why not? 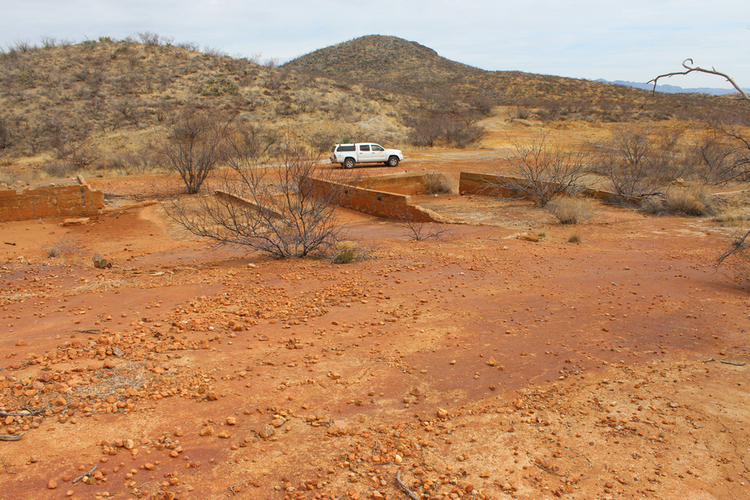 I have looked at the BLM records for the mining claims associated with this location. There has been interest in the area through the years. Several claims were kept active through the 1990s and then they too were abandoned. That happened in 2001. I would have liked to have poked around a bit more, but this had been a day trip for me. It had been a very interesting trip to an area that I had not been to before. I had enjoyed the ride almost as much as the walk around the mine site. I did take a couple of short breaks on the drive out. 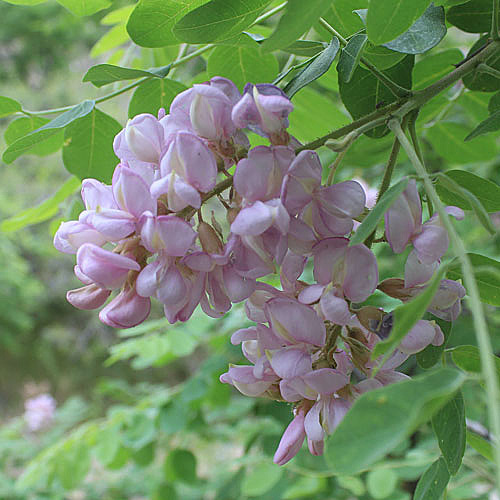 One was to look over a small grove of New Mexico Locust trees. I had never seen them in bloom before. 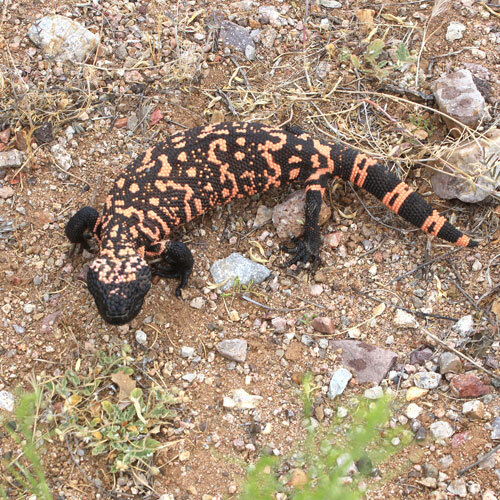 The second stop came when this fellow chose to cross the road in front of me. That was pretty neat. 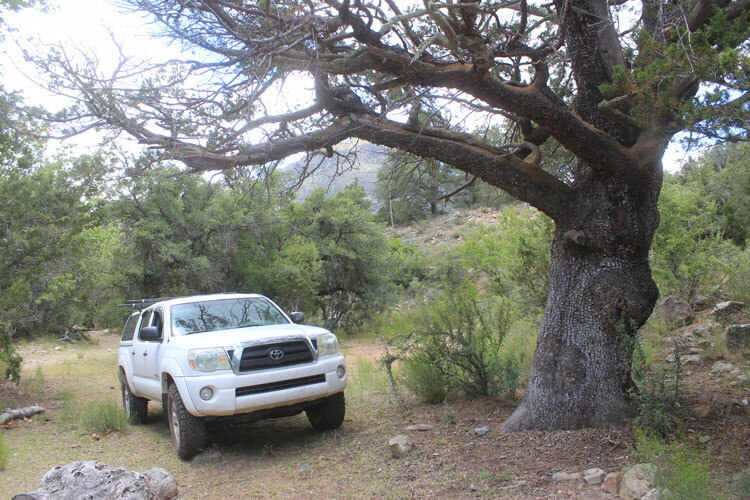 This trip was the latest that I had made over to the Aravaipa area. 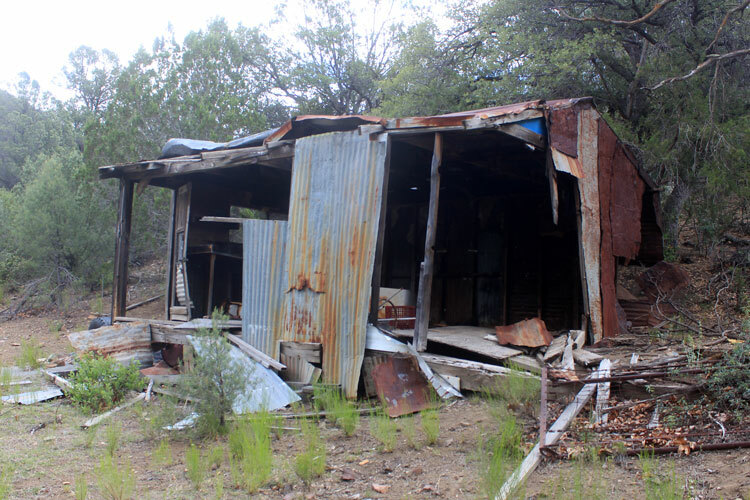 Previous trips were to the old town of Aravaipa and Landsman Camp, the Hell Hole of the Aravaipa, and several other past producers in the Aravaipa Mining District.